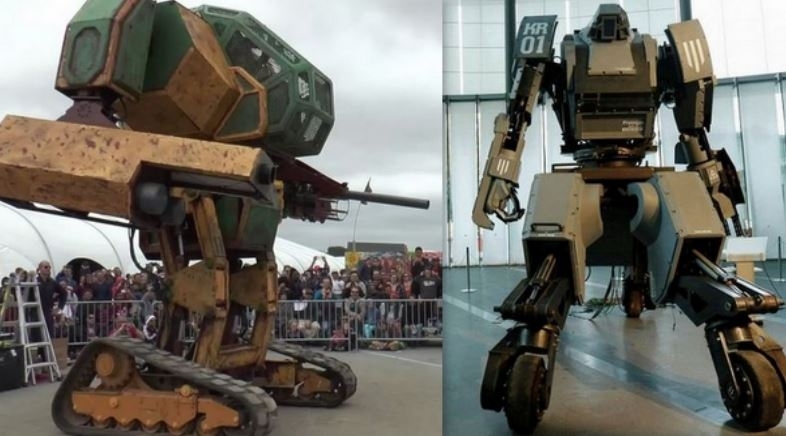 Two giant fighting robots - one American and one Japanese - are to face off against each other in a melee battle next year. Boston-based company Megabots issued a challenge to Japan's Suidobashi Heavy Industries last week, offering to pit their 15-foot, six-ton Megabot Mark 2 fighting robot against Suidobashi's Kuratas, a smaller but faster 12-foot, 4.5-ton robot. Both machines are piloted by drivers who sit inside them; a single person controls Kuratas, while Megabot can hold two people. Each robot is equipped with several projectile weapons; the American Megabot can fire giant paint balls at more than 100 miles per hour, while Suidobashi's machine packs twin, six-barrelled Gatling guns that use BB-sized pellets, as well as an advanced targeting system with a heads-up display. Despite all the weapons at the robots' disposal, they will have no influence over who wins the battle. Suidobashi has said Kuratas will only participate if the fight is hand-to-hand. Although the robots may appear evenly matched, there are some big differences. The Megabot Mark 2 cost around $175,000 to make and runs on a pair of giant tank treads, whereas Suidobashi sells Kuratas for more than $1 million and its four swiveling wheels make it three times faster than the American challenger. Kogoro Kurata, Suidobashi's founder and chief executive, seemed surprised by the challenge and took a few jabs himself. "Come on guys, make it cooler. Just building something huge and sticking guns on it. It's... super American," the CEO said, adding "We can’t let another country win this. Giant robots are Japanese culture." MegaBots co-founder Matt Oehrlein says both teams will need time to make battle modifications. He asks Suidobashi to name a battlefield where their giant robots can face off in one year. The Japanese company made its own response video in order to accept the offer.